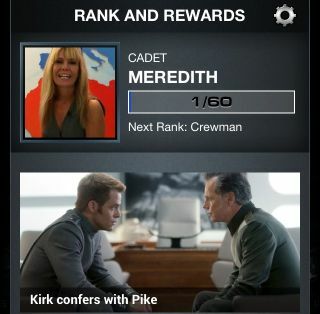 Earn rewards for prizes by tracking down movie images and other Star Trek-themed tasks. Paramount Studios this week launched its promo app "Star Trek Into Darkness" in advance of the widely anticipated sequel to the 2009 film "Star Trek," due to be released in theaters on May 17. The free app for iPhone and Android lets players work through various missions to unlock content and earn chances to win prizes in ways that bridge the app's virtual world with the real world. Don't expect to fight side-by-side with Captain Kirk. Instead, you'll track down movie posters, photos and comic book covers. Of course, you could actually go to a comic book store, but the app seems just as satisfied with scanning a computer screen as the real thing. In addition to a visual scanner, the app also has an audio scanner that "listens" to your computer or other device to match trailer soundtracks and score more points. The app also sports a relatively new feature called geofencing, an extension of geolocation , which automatically alerts users when they near a designated place. Currently, if you visit The Presidio in San Francisco, which the app says is the future location of the Starfleet Academy, the app will detect your location and you'll get your 20 points. Come May, the app will let you know when you get close to a movie theater, so that you won't miss the next showing of the new Star Trek film. "Star Trek into Darkness" is available for free from the App Store and Google Play. You can create an account by signing in with your Facebook, Twitter or email address.